All furniture develops a patina of fine scratches with use. Occasionally, an accidental nick or scratch occurs that is beyond the definition of patina and requires touch up. While it may not be possible to render such a scratch invisible, it's possible to make it virtually unnoticeable. Simply use a dry, soft, lint-free cloth for routine cleaning. Periodically you may want to add a little Orange Oil on your cloth. Occasional cleaning with Murphy’s oil soap or mild dish soap is also OK; just dry the surface to a clear sheen afterwards. Products containing ammonia or silicone, like Pledge or Windex are NOT recommended. Wipe up spills immediately and dry completely. Do not allow moisture to remain on your furniture. It will eventually seep through even a water-resistant finish. Use a trivet or placemat with heated objects. Do not place hot items directly on your surface. This includes laptops since they can get extremely hot on the bottom. When writing on a wood surface, protect it with a writing pad. Solvents, alcohol, nail polish and remover can cause irreversible damage to the finish. Maintain even humidity conditions in your home. Do not use commercial waxes and spray polishes. Do not place in direct sunlight. Polish items frequently if exposed to direct sunlight. To touch up a scratch or nick, lightly dab the area with paint or stain from the original can. If too much finish is applied, wipe it off before it dries and try again. You can use a tiny artist brush or a foam brush for a very small imperfection. Once it dries, you may sand lightly with a 3m buffing pad. If Waterbase Topcoat was used, finish off the with a light application of Topcoat over the repaired area. Use water for any clean up. To maintain the finish, mild dish soap is recommended for cleaning up after spills, just as you would clean woodwork. Vinegar can also be used. If a mild abrasive is needed, baking soda toothpaste works well when applied with a soft damp cloth. For additional protection, there are many products on the market., and some are hazardous to your furniture's health. Cleaners such as Pledge and Murphy’s Oil Soap are not recommended because they leave a dull residue on the finish. Never use products containing ammonia on water base finishes. Polishes such orange oil work well for routine maintenance. The following are some tips on the different types of polishes. Orange Oil is by far the most popular. It can be used on any finish and does a superb job of removing everyday dirt and dust. It is often compared to lemon oil - however the big difference is that lemon oil contains mineral spirits. Orange Oil is all natural, non-combustible and made from real orange rinds. We love its fresh orange scent. 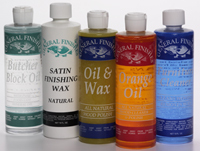 Satin Finishing Wax (natural or dark) is a dual-purpose product. It can be used as a polish for rubbing out new finishes or as a scratch remover for worn surfaces. It works well over both oil and water based finishes, including Danish Oil. We recommend a wet sanding process followed by buffing to a soft silky sheen. Butcher Block Oil is an excellent protectant for all butcher block surfaces. It is FDA approved for protecting wood surfaces that come in contract with food: Simply wipe on, allow 5 minutes to penetrate and wipe off the excess. Use on cutting boards, utensils, bowls, butcher blocks, etc. Odorless. Furniture Cleaner is our strongest heavy duty cleaner with a mineral spirits base and is designed for serious cleaning applications. Apply with a 0000 grade steel wool to remove old oils, wax and grease from any wood surface. After the surface is clean, apply General Finish's topcoats or Satin Wax to bring back luster.